Just two and a half hours on one of our Urban Sherpa coaches from NYC places us on Hunter’s varied terrain. The mountain at Hunter includes steep vertical, multiple parks, access to moguls, speed run-outs for experts, and gradual lines for beginners. Hunter has been a mainstay for New Yorkers for years and is our old-school property with its traditional Adirondack-style lodge. But Hunter has added the Kaatskill Mountain Club a new hotel on hill that rivals any slope-side accommodations in comfort and service. 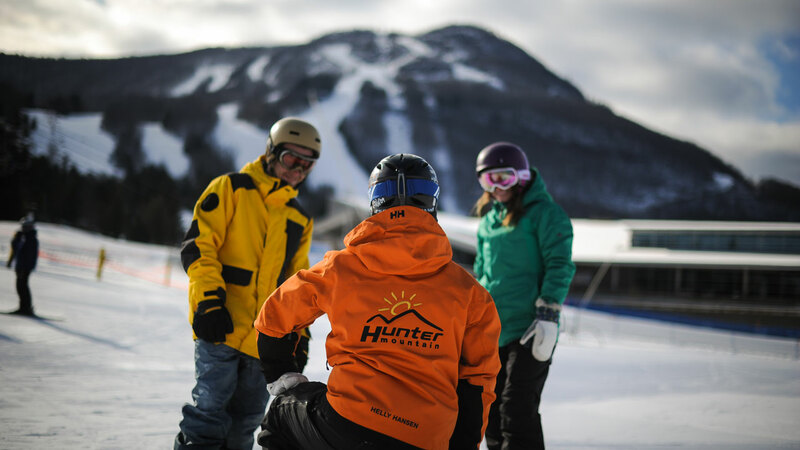 With Hunter One, an independent training mountain enhanced by its own user-friendly lifts and specially designed terrain within the larger resort, beginners at Hunter easily master a sequential series of skills, gaining confidence at each level. Hunter’s new, state-of-the-art Learning Center streamlines the learning process by combining cutting-edge equipment, unique teaching methods, and a dedicated beginner mountain with a new facility designed to make getting from the parking area to the slopes as effortless as possible. Hunter has inspired Burton to designate the hill as an official Learn-to-Ride center. What’s that? Burton engineers have innovated Learn-to-Ride (LTR) products specifically designed to accelerate learning. Developed in conjunction with the American Association of Snowboard Instructors (AASI) and major resorts around North America, the LTR methodology assists people to link turns—actually feel what it’s like to snowboard—in the first lesson. Coupled with the LTR learner-specific products, it’s a methodology that makes learning to snowboard fun, easy and painless. OK, not painless. 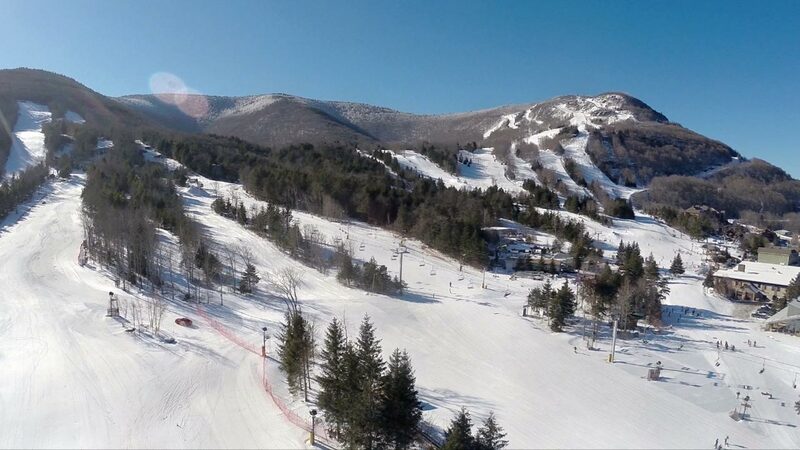 Hunter Mountain has recently been recognized by the National Ski Areas Association for its dedication to the growth of snowsports, earning the industry award for having the Best Program to Grow the Sport to New Participants. Lastly Hunter has performance camps and workshops all winter long: Women Learn to Ride, Mogul Workshops, Slalom Workshops, and Park and Pipe Seminars. There are many more reasons to ride Hunter, but the best way is to discover them for yourself—ride its perfectly groomed slopes, drink in one of the many popular pubs and eat from the area’s many restaurants. 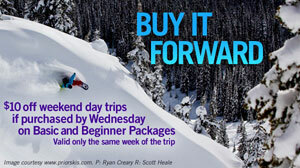 Basic Package includes a round-trip bus pass and lift ticket Sat, Sun $105 / mid-week $95. Full Beginner Package includes a round-trip bus pass, a lower-mountain lift ticket, 90-minute group lessons, and a ski or board rental $150 / $140. Explorers Half-Day Ski Package (ages 4-6) includes a round-trip bus pass, lift ticket, gear rental, and a two-hour group lesson $160 / $150 best purchased a few days in advance to guarantee availability.. Lessons are 10 AM-12 noon & 1:00 PM-3:00 PM. Explorers Full-Day Ski Package (ages 4-6) includes a round-trip bus pass, lift ticket, gear rental, 2 two-hour group lessons, and lunch and snack) $230 / $220. best purchased a few days in advance to guarantee availability..
Mountaineers Half-Day Package (ages 7-12) includes a round-trip bus pass, lift ticket, ski or board rental, a two-hour group lesson) $160 / $150.best purchased a few days in advance to guarantee availability..
Mountaineers Full-Day Package (ages 7-12) includes a round-trip bus pass, lift ticket, ski or board rental, 2 two-hour group lessons, and lunch and snack) $230 / $220. best purchased a few days in advance to guarantee availability..
Round-Trip Coach Transport Only includes a round-trip bus pass. You may also add lift ticket, lesson, or gear rental options $55 / $49. One-Way Coach Transport Only includes a one-way bus pass. You may also add lift ticket, lesson, or gear rental options $45 / $39. Lift Ticket Just need a lift ticket? Buy it here and pick it up on hill from your Urban Sherpa Leader Sat, Sun $65 / mid-week $50. Lesson Add a 90-minute group lesson, its always a good idea. (beginner, advanced beginner, or intermediate levels available) $35. 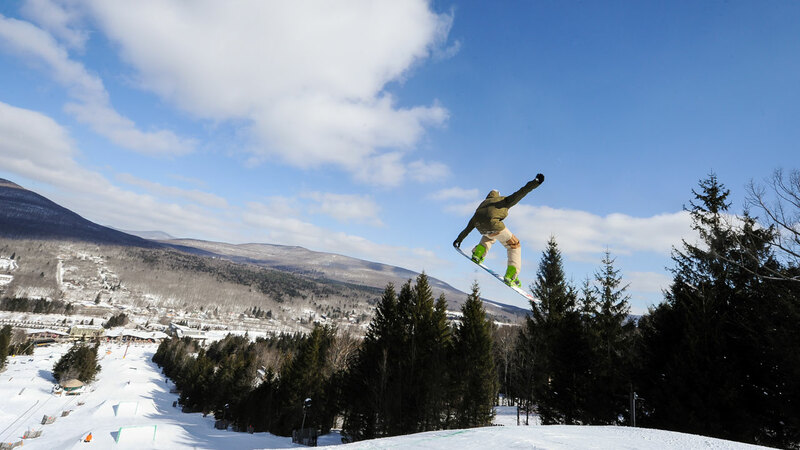 Outerwear leasing can be arranged through Hunter Mountain Outfitters.